Our mission is to help others survive with Mesothelioma. 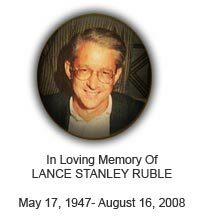 Mesothelioma Applied Research Foundation "Believe in a Cure"
Lance S. Ruble was a loving husband, father, grandfather, and brother. He was diagnosed with Pleural Mesothelioma on August 7, 2007 and passed away on August 16, 2008. Though Lance is no longer here with us, his spirit lives in OUR MISSION. Our family hopes to help others by sharing our information and support, advocating for the ban of asbestos, bringing awareness to mesothelioma, and most of all searching for a CURE. Lance embodied the meaning of LIFE. He owned a successful construction company called, “Universal Drywall & Plastering, Incorporated.” He also gave back to the community by establishing the Florida Inline Scholastic Hockey League in South Florida High Schools and was an active donor for HOPE Outreach Center. But his greatest accomplishment was being a family man. He was a devoted husband and married to his wife, Joni for 33 years and had two children, Erica Leigh and Michael. Lance also became a grandfather for the first time just two days after his mesothelioma diagnosis when his daughter gave birth to a baby named Brock. Throughout his year-long battle with this vicious disease, our family tirelessly searched for the best treatments and doctors. What we discovered, however, were grim statistics, underfunded research, and treatments that severely sacrificed quality of life. This website is dedicated in honor of Lance as our family continues to search for better treatments while sharing our story with others.